Along the I78 Corridor, approximately 35 miles north of San Diego, the gorgeous coastal City of Oceanside, California is waiting for you. 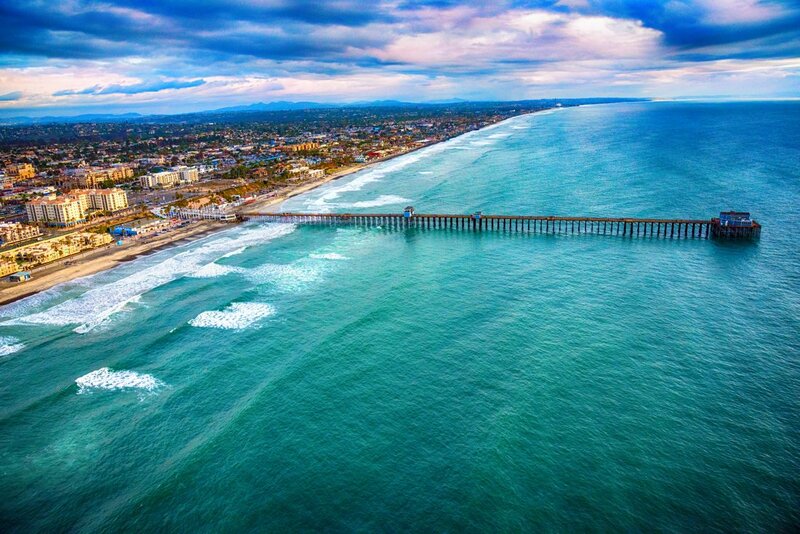 Home to around 183,100 residents, Oceanside is an integral part of the “Tri-City” area, along with Vista and Carlsbad. If you are in search of the quintessential California luxury lifestyle, you must consider all this North San Diego County city has to offer. With 3.5 miles of white sand beach and postcard perfect palm-lined streets, Oceanside is a beach community through and through. The city is home to a small craft harbor reminiscent of those found in New England, and the west coast’s longest wooden pier, among many other spectacular features and amenities. When you buy a luxury home in Oceanside, you are positioning yourself to easily enjoy all of the outstanding recreation options in the area. Every day will feel like you’re on vacation with the endless opportunities for canoeing, jet-skiing, sailing, scuba diving, surfing and whale watching. And there is a multitude of on-land activities from which to choose as well, such as golfing, cycling, and skateboarding. With the gorgeous year-round weather, it is also delightfully convenient to travel to the world-renowned San Diego Zoo, SeaWorld San Diego, LEGOLAND California Resort and Disneyland California Resort. Not only does Oceanside have an abundance of recreation and entertainment, but this authentic beach town also has remarkable shopping and dining options. Just 12 minutes from Oceanside, via County Highway S21, you’ll find Carlsbad Premium Outlets where you can shop Polo Ralph Lauren, Juicy Couture, Tommy Hilfiger, Salvatore Ferragamo, Calvin Klein, Barneys New York and other fabulous brands. Carlsbad also has a few exceptional fine-dining establishments from which to choose. Vivace is a 4-star Italian restaurant that is sure to impress, and California Bistro is a 5-star restaurant offering some of the most delicious burgers you will ever have the privilege of savoring. Other upscale dining opportunities can be found in Rancho Sante Fe at Mille Fleurs Restaurant, in Del Mar at Market Restaurant, and in Solana Beach at Pamplemousse Grille. Of course, these are just a few of the many extraordinary options. In addition to all of that, Oceanside also affords residents their choice of schools. Oceanside residents may attend schools in the Oceanside Unified School District, Carlsbad Unified School District or Vista Unified School District, depending upon their address. Oceanside boasts four top-rated schools: Ivey Ranch Elementary, Bonsall West Elementary, Mary Fay Pendleton Elementary and Mission Vista High School, all of which have a 9 out of 10 rating. Carlsbad Unified School District has an overall rating of 9 and boasts four schools with a 10 out of 10 rating: Mission Estancia Elementary School, Aviara Oaks Elementary School, Aviara Oaks Middle School, and Sage Creek High School. There are also several prestigious private schools in the area. Adding to the allure for luxury home buyers with children, Oceanside has thirty city parks, two swim centers, four recreation centers, and two public libraries, all within the city’s forty-two square miles. Furthermore, Oceanside is home to the California Surf Museum, Oceanside Museum of Art and the Heritage Park Village & Museum. If you have already been won over by the long list of impressive features and amenities Oceanside has to offer, just wait until you see the extravagant homes here! Large and lavish Oceanside properties can be found in the 92054, 92056 and 92057 zip codes. Listing prices for luxury homes in this esteemed coastal city vary widely depending on the home’s size, style, special features, views and proximity to the water. Many of these elite properties were designed by famed architects and have been meticulously maintained or recently upgraded. You have private, gated homes and homes with breathtaking ocean views, homes on multiple acres and homes with guesthouses. The Oceanside luxury real estate market includes homes with pools, swanky special features, enchanting landscaping, and every other alluring attribute your heart could desire. If you’ve been dreaming of a life of supreme luxury and convenience in a place with endless sunshine, please allow us to assist you in your search for the perfect Oceanside, California luxury home.